I have a confession to make… I don’t play any instruments. Not the recorder, or the harmonia…. but especially not the piano. Growing up, I spent a lot of time singing in the choir, but I always wanted to be one of the cool kids who could sing and accompany themselves on the piano. A few years ago, we purchased a weighted keyboard, with the intention of the kids learning to play so they would never find themselves wishing they had some sort of musical skill, but we haven’t made a ton of progress. 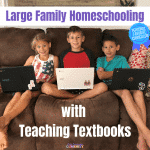 That is why I was glad to be chosen to review HomeSchoolPiano‘s Lifetime subscription for their Complete Set of Books with the Schoolhouse Review Crew. What do you get with the HomeSchoolPiano Complete Set of Books? 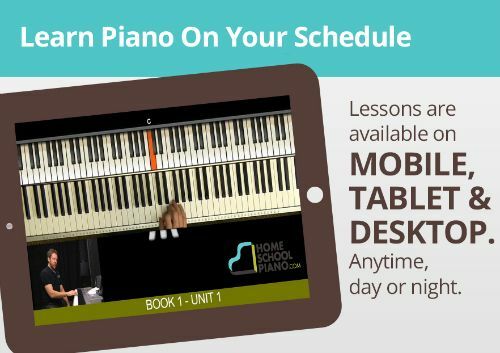 HomeSchoolPiano is a video based system that runs on your computer, tablet, or even smart phone. You can access the videos any time online, or even download the content for offline access. Core Piano covers all the fundamentals of playing the piano, including posture and hand position, scales, basic notation and reading music. There are 33 lessons in Core Piano. This is where most beginners will start, unless they already have experience playing the piano and reading music. This is a very “beefy” beginners program, so I would suggest everyone start here, regardless of experience. Book 1 covers six original pieces, beings to teach improvisation skills, and continues to expand on your musical vocabulary and skill set. 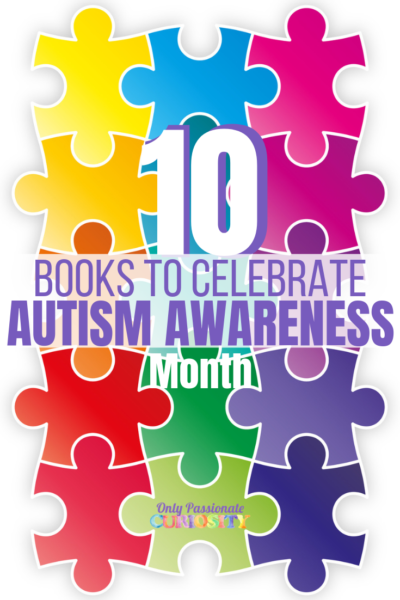 There are 6 units in book 1, each consisting of about 7 lessons, with quizzes. Book 2 and Book 3 take piano practice even deeper, continuing to focus on theory, reading music, improvisation, ear training, technique and so much more. 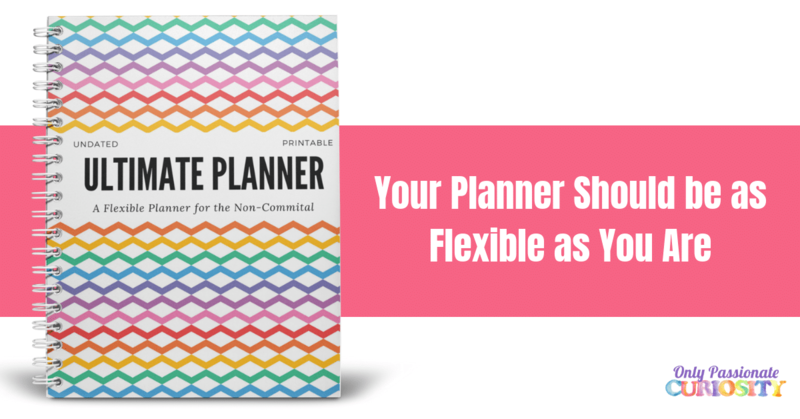 Each book has 6 units, with 7 lessons and quizzes each. All books, and the Core Piano program come with downloadable PDF “workbooks” with about 50 pages of sheet music for you to practice with. I printed off my workbooks on half pages (two pages per sheet of paper) and spiral bound them to use at the piano. I really liked that I could stream the content through my iPad. In the past, when we have used computer based piano programs, it’s been difficult to balance the laptop at the piano, but with the iPad, it just fit right on the sheet music stand. Each lesson’s video is relatively short, 5-10 minutes or so. On the screen, you’ll see Willie (the teacher) small in the corner, a shot of the piano with his hands playing, and an computer animated piano on which the keys being pressed highlight, so you can clearly see exactly what notes are being played. The lessons are incremental, and teach a specific principle or skill. You don’t just jump in and learn patterns and songs by ear- you really learn music theory, and how to play the piano as you learn to read music and actually play. Musical vocabulary is included, so you are getting a complete music education. As you progress from Core Piano onto the other books, the lessons stay about the same length, but the program adds in a quiz element to make it easier to track your progress and retention. The quizzes are sort (just a handful of questions) but include audio clips, vocabulary, theory and more. I think they are a very nice addition to the videos to make the program a little more interactive. After each lesson, you’ll want to practice the new skills at the piano (using the workbook as needed) to make sure you really understand the concepts and how to properly execute them. For us, that meant sometimes watching the lessons more than once, and practicing the skills again and again until they became easier. 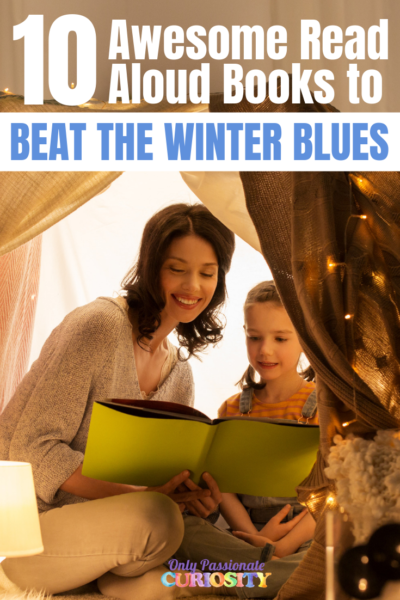 For my younger kids, this may take just one or two repetitions, or in the case of more difficult skills, a whole week of time practicing at the piano before we could move on. Since the lessons are in video form, you never have to feel rushed to move on, or embarrassed if you haven’t quite mastered a concept. You can always go back at review past videos, or just take a break to practice before moving on. We experienced a bit of a glitch with the website during the time we worked on this review, which ate into some of the time we had to really use the program. During this time, the HomeSchoolPiano was very good about communicating the changes they were making to remedy the situation (they changed servers to accommodate their larger audience- the program is growing fast!) and I received friendly and fast support every time I needed to contact them. Reliability has improved as we worked on this review, but is still not 100%. Hopefully, it will be completely fixed soon. We started in the Core Piano book because most of us have very little piano experience (Bug has some from a previous piano program- but I wanted him to start from the beginning also) and we all worked together by watching the short lessons, and then taking a go at the piano to practice. At this time, HomeSchoolPiano didn’t quite light the boys’ fire. It’s a very solid product, but I think the combination of their young ages (6 and 8) and the stress of getting ready to move stood in the way of them really getting into learning piano. They are just a little too “squirrel-y” for this particular program. This program is a real music program, it’s not childish, it has real vocabulary and moves quickly. One of the things I really appreciate about HomeSchoolPiano is that this product doesn’t expire- just because it wasn’t the perfect fit right this second doesn’t mean that I am “out of luck”- we will not run out of time, and I can set it aside with no guilt, and pick it up again in the future without any worries. What the boys really did like about the program is the teacher, Willie. As homeschooled kids, they don’t have a lot of exposure to male teachers, and they thought it was super cool that a man was playing piano. (yes, we are in the “girls have cooties, and boys are awesome stage of their adolescence.) I found Willie to be exactly the kind of teacher I would want to hire for the kids, if I were to pay for lessons (which, I really could never afford. 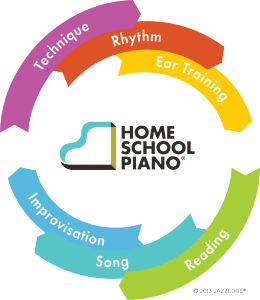 Thank goodness for products like HomeSchoolPiano making lessons affordable for families like mine). The teacher is pleasant, thorough, and easy to follow. The only real downside of HomeSchoolPiano comes back to the nature of a video teacher- unless you as a parent have experience playing piano, it would be hard to know what corrections your child needs to make. The lessons do start at a very basic level, so a parent with little experience can learn right along with the program, and progresses nicely with theory, reading music, and improvisation. 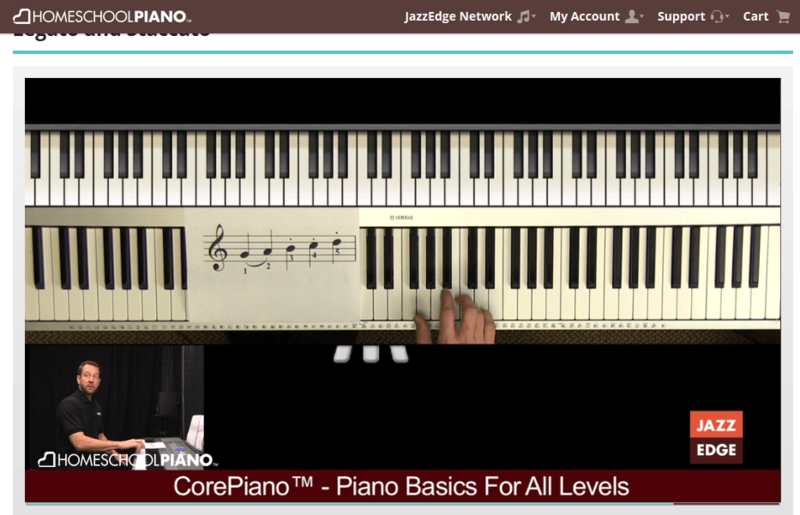 HomeSchoolPiano is a fantastic start, and will tide you over for a long time. However, I personally feel like I would need a physical teachers support once my kids got to the more advanced levels. Even though it is advertised for all ages, I think ideally, HomeSchoolPiano is best for older kids- maybe the 9-12 age range, and older beginners, because the lessons get right down to business- it’s not playful as much as it is complete. I do feel like this is a great product, and I am excited to work with it by myself once we get settled in at our new home and have a little more room to breathe. Hopefully, I’ll learn well, and be able to encourage the kids even more though example! Don’t just take my word for it! There are 89 more HomeSchoolPiano reviews for you to check out over on the crew blog. Every family has a different experience and expectations, so despite my kids not falling head over heels for this program, it looks like we are in the minority. I especially enjoyed reading the experience of KGB That’s Me! who really broke down the content of the lessons for you to see, and A Nurse’s Wildflowers, who found a creative way to include even her younger children with the program. Click the banner below to read even more reviews. Hey there! Thanks for the shout out! I loved your review by the way. Very good job! Is you rating system a plugin? I think that is a wonderful touch!